Suppliers of intelligent herbicides and technologically- advanced machines update their offerings to help wage the war on unwelcome vegetation. When it comes to vegetation management, versatility of equipment and the ability to get on and off track quickly to accommodate tight track times, are two of the most sought after features. 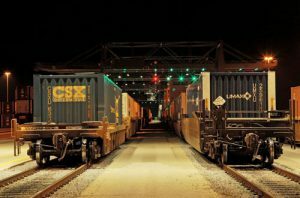 Suppliers and manufacturers have worked on these and other quality enhancements in the past year for the betterment of the railroads. Over the past two years, Asplundh has implemented its Automated Vehicle Management System (AVMS) to monitor all of its spray vehicles and track the GPS locations the herbicide is being applied. This information is overlaid onto customer track layouts in an online system. Asplundh is able to obtain real-time information on location of assets and spraying operations, as well as archive this information for future access. The company also utilizes a SkytTrim truck, which is a 70-foot boom SkyTrim mounted onto a truck chassis. This vehicle is designed to be more productive and efficient by eliminating support vehicles and department of transportation permitting for moving standard skytrims and jarraffs. 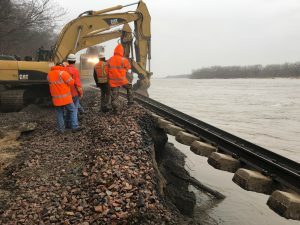 Haines says the market will always continue to drive customers’ budgets and what they are able to allocate towards vegetation management; however, the company has been fortunate enough with railroads adding bridge projects, cutting at satellite locations and other cutting programs. The tool has an auxiliary 200 horsepower engine to provide hydraulic power for the attachments. It is a universal unit that has the ability to pull cars with its own train brake system designed for versatility of multiple uses, including high-capacity brush cutting/clearing. In Canada and the Northern U.S., Gettis notes that it is a critical component for keeping the track clear of snow for winter operation and essential for visibility at crossings. He says that brush cutting is always a priority for the railroads. “It does not go away whether times are good or tough,” he said. Dow AgroSciences LLC says it has committed extensive resources to developing new and innovative herbicides suited for the railroad market and plans to add a couple to its portfolio in 2016. First, is a high-load, four-pound amine triclopyr formulation, which has a “Caution” signal word instead of the previous “Danger” signal word carried by the current Garlon 3A specialty herbicide and generic options. The company will also be introducing a new, branded bareground product, which Dow AgroSciences says will offer incredible control for bareground applications, along with season-long residual activity. These products have undergone extensive testing and are in the final stages of approval with the Environmental Protection Agency. Managing weeds in bareground applications to avoid resistance is an important part of effective vegetation management, noted Deckard. Repeating the same prescriptions year after year has proven to be a recipe for resistant species to develop and thrive. The railroad industry has seen this with a number of the products, which were considered the standard mixes 10 years ago and are now essentially ineffective today. Dow AgroSciences says it is working to offer alternatives for effective resistance management, as well as developing better formulations of existing market standards. President of Mitchell Rail Gear, Estel Lovitt, says customers have been asking for lower-cost solutions for vegetation control. For this, Mitchell has developed a rail gear system for track Skid Steer Loaders that will accept a variety of brush cutting and mulching attachments independent of the Skid Steer Loader quick coupler. 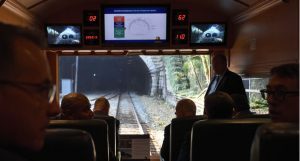 “Re-growth is a problem that has to be constantly dealt with by all size railroads,” explained Lovitt. “Allocating railroad track time for on-track brush cutters can be difficult, considering that railroads make their revenue by running freight. Across many industries, Skid Steer Loaders have become a low-cost solution to vegetation control. It is a solution that Lovitt says delivers flexibility and maneuverability sometimes better than many larger machines. A Skid Steer Loader with rail gear does not limit the machine functionality and maneuverability. It can travel to areas of overgrown vegetation and get off track and clear large areas of vegetation and trees and then get back on track to travel to other areas with very limited track down time. “There are a variety of companies that make excellent vegetation control equipment, such as brush cutters, mulchers and spray equipment,” he commented. 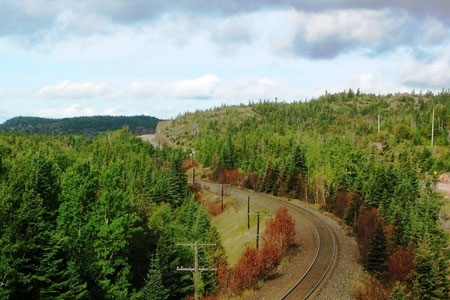 NMC Railway Systems is continuing to expand its line of hi-rail equipment to combat remote vegetation growth and other maintenance-of-way projects. Mark Anderson, sales manager, says one of the most popular pieces of equipment in the company’s product line is the CHX20E Hi-Rail Excavator. 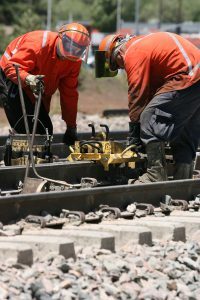 This 320-sized model allows railroads and rail contractors to utilize multiple tool functionality including brush cutters available 36-inches in diameter. He notes that the flexibility of the CHX20E Hi-Rail Excavator provides operators access to remote rail areas to manage potential overgrowth areas early in the season. In addition, when paired with a Rototilt, the operator has the ability to rotate the attachment head 360 degrees. NMC Railway Systems says machines that allow for multiple tool functionality are driving demand, which allows for increased productivity on rail maintenance projects without causing downtime during open track windows. Progress Rail’s Kershaw Division has been serving the vegetation management industry since the early 1970s. The company’s latest offering combines field expertise in vegetation control and railroad maintenance. Progress Rail has outfitted a third-party highway chassis with both hi-rail gear and technology stemming from its 75-foot SkyTrim tree trimming unit. This allows maintenance-of-way customers to manage vegetation challenges along the many miles of track in their care. The company says its updated SkyTrim offers the flexibility of production cutting, while also mobilizing quickly and easily to isolated jobsites. This latest unit in the product line, which includes an all-terrain, rubber tire 75-foot SkyTrim model, is available with track gear and friction drive hi-rail options. Rail Construction Equipment Co. (RCE), has focued this past year on expanding the Railavator (hi-rail excavator) product line. The Railavator serves as the prime unit for RCE’s brush cutters and, now, the company has four Railavator models available that can support a brush cutter. The models range in size, starting at the 85G, 135G, 245G and 250G as the largest, boasting cutter heads up to 72 inches wide. Offering multiple options, RCE’s brush cutters can be customized by excavator model (hi-rail and conventional) and size of tree grinding and brush clearing heads. The available mowing heads make a clear cut without the hazards of flying debris, notes RCE. Supertrak introduced three Tier 4 models, including the SK170RTL wheeled model 170HP, 140HP powerpack and 350HP powerpack for excavators, which are all equipped for operating mulchers with maximum cooling and performance, the company notes.